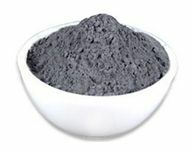 Tungsten carbide (WC) powder is manufactured with Tungsten metal powder and pure carbon powder, e.g. carbon black, at 900 - 2200°C in pushers or batch furnaces. Macro Tungsten carbide powder is used as additive for cemented carbide, or thermal spraying. Casting Tungsten carbide powder is made by melting Tungsten metal and Carbon together. It has two eutectic compositions: WC and W2C. It is manufactured through insufficient quenching into extremely hard solid particles of fine crystal structure.